Salento peninsula was considered for centuries the ‘door of Italy’, a border land, where the historical events influenced the settling down order also because of its geographical position. This allows the creation of highly complex defence systems and the testimony is given by the fortified castles built to defend the land. They were surrounded by big blocks of stones. It is still possible to see some remains in Vaste and Muro Leccese. These complex systems of defence were used especially after the fall of the Roman rule. 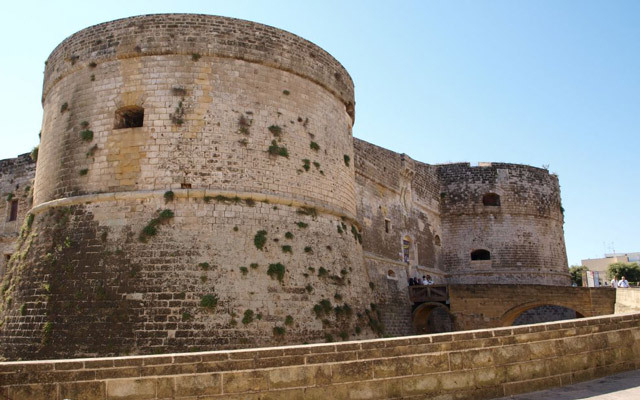 In Otranto, Aragonese Castle was built between 1485 and 1498 and is surrounded by a deep ditch with three cylindrical towers and a bastion shaped as a sharp lance. Under the Spanish occupation a big part of the castles were rebuilt and reinforced. It is also worth noting Acaya Castle, a small village that is 11 Km far from Lecce. It was built by Alfonso of Acaya between 1496 and 1506, then enlarged and fortified by Gian Giacomo during 1521. The plan of Medelungo Castle is star-shaped and its nucleus dates back to the XVII century. The fort, enlarged by Ameli Barons, is now inhabited by the Sisters Stigmatiche. Andrano Castle was built by Spinola family during the XIII century; its plan is squared and has a circular tower. Depressa Castle, after its reconstruction in 1548, was changed into a farm with its squared towers, its open gallery and its stair. Tricase Castle was supplied with a defence system during the XIII century, when the feud belonged to Pignatelli family. The inhabited part was surrounded by a large ditch and had two doors that faced the sea and the countryside. As it always happened, the Turks destroyed almost entirely this defence system that was then rebuilt by the Gallones during the following century. Along the walls it is still possible to see two vertical fissures along which ran the drawbridge chains. Tutino Castle (Tricase hamlet) has a modest size and was built in 1580 by the feudatory Luigi Trane. Till some years ago it still preserved the internal furniture formed by the gallery and the Prince throne. Caprarica Castle is particularly significant for the peculiar structure of the walls parameter and the yellow colour of the walls that are made of carparo. It has a squared plan, four cylindrical towers located at the corners and has also a machicolation with three mouths that defends the central door. Lucugnano Castle has a severe and embattled quadrangular tower. It was built during the XVI century by Castrista Scandeberg family and then was passed on to Capace family. Alessano Castle with its sixteenth century faAade that was built by Gonzaga family and the adjoining San Giovanni Palace overlook the surrounding land. Morciano Castle was built by Guglielmo VI of Brienne around the first half of the XIV century. It has a squared plan and at the corners there are cylindrical towers. Only one of them maintained its original size, since one was demolished to leave its place to a chapel and the other two became part of a fortification of a following period. It has embrasures, loopholes and gunners for small artillery. The castle was defended by a row of tower houses. Ugendo Castle has an irregular trapezoidal plan with angular towers of which two are no longer present. Supersano Castle was erected following the order of two Generals of Carlo V after the battle that took place in 1528 at the slope of the hill by the present cemetery. Here there was a small church, called Vittoria Crurch, that was then destroyed and whose altar was brought in the basilian crypt. At the present time it belongs to d’Amore family. Ruffano Castle rises in the wonderful square of the village and on the site of a previous fortification that dates back to the Medieval period. Casarano Castle is considered the biggest chatelaine residence in Salento and its faAade is 120 meters. It is made of carparo. Parabita Castle belonged to Castrista family. On the faAade there is the coat-of-arms of Ferrari family who lived there during the XVIII century. 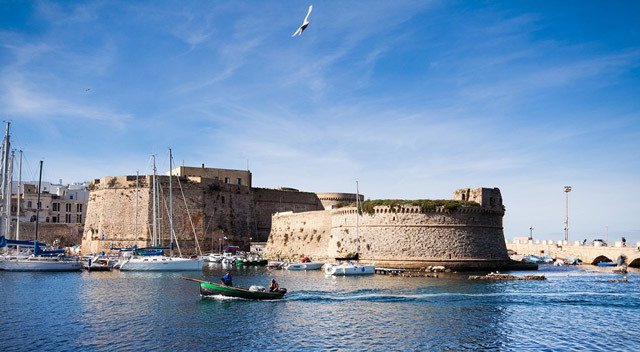 Gallipoli Castle was rebuilt during the XVI century incorporating the previous Angevin foundation that was raised on a Byzantine fortification. NardA? Castle has mandorla towers and is at the present time the town-hall. Corigliano d’Otranto Castle has a squared plan, four angular towers and is surrounded by a ditch. It is stretched on a surface of about 730 square meters. Several Baroque decorations were added later on between 1500 and 1600. Copertino Castle was built between 1530 and 1540 by Evangelista Menga on the remains of a Medieval dwelling and has a Renaissance doorway conceived as a triumphal arch. Let us also mention Castro Castle that rises on the remains of a stone and represents a significant example of Medieval architecture. In Santa Maria al Bagno, the castle is also called ‘the four columns’ even if there is still little of its angular towers of a quadrangular base of the sixteenth century. Last but not least, Lecce Castle that was built following an order of Carlo V. It has a trapezoidal shape; it is separated by a middle yard with four struts of different size at its sides. It has a remarkable architectonic interest. Here press to find out more are some guidelines on the pertinent points you should look into.